I can be stubborn about not listening to anybody. Even so, I’ve read three books about raising littles, and The Science of Parenting by Margot Sunderland is the second. It advocates a way of parenting that aligns with what I’m already doing, so reading mostly felt like a continuous pat on the back. However. If I were parenting differently, I’d probably feel nothing of the kind. I’d probably feel like a recipient of Chinese water torture, an insidious drip drip drip of you’re doing it wrong. And how exactly is that helpful? Most parenting tomes are biased in one way or another, naturally. 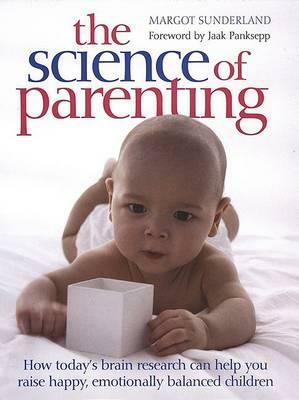 But I expected a book called The Science of Parenting to be, I don’t know, truer to the spirit of scientific inquiry and reportage. I think we can all agree that persistent high levels of stress chemicals have harmful effects on the developing brain. That’s why we don’t abuse or neglect our children. But is it enough to tout the scientific superiority of attachment-style parenting? I doubt it. Because the momentary, infrequent stress caused by controlled crying or spanking or time-out is a far cry from long-term neglect or abuse, and to lump them all together is expressly unfair. It’s hard to believe that a child who is receiving plenty of love and affirmation overall will suffer irreparable damage from, for instance, a few hours of sleep training. Besides, I’m sure separation anxiety is stressful, too, but I still need to shower sometimes. There’s nothing really problematic with The Science of Parenting, except that it doesn’t actually uncover the science of parenting. These days motherhood feels more like art than science, anyway. Sunderland preaches nicely to the choir but I don’t see this book drawing new converts. For a more solid foray into the existing body of research, I’d recommend John Medina’s Brain Rules for Baby. The writing is better! 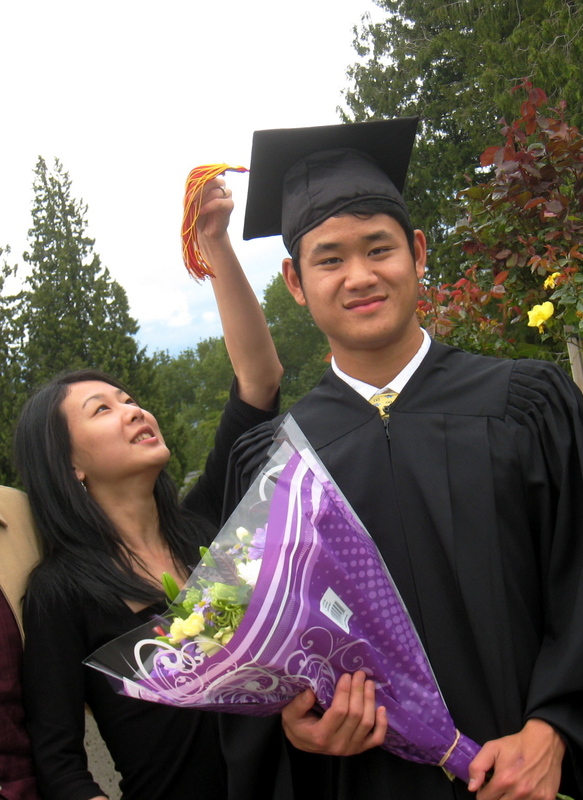 Two years ago, in May 2008, I graduated with a BSc in cell biology and genetics. 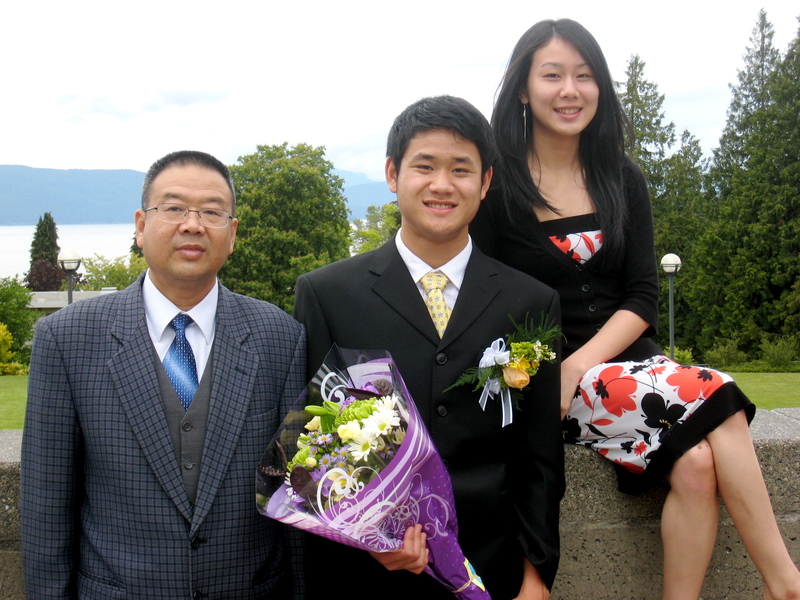 Convocation was somewhat overshadowed by my wedding, which was coming up in a week. Initially I wasn’t too interested in attending, but I did, because when I told my parents I intended to skip my mom got upset. This month my brother graduates high school. The ceremony was even held at my alma mater. Does it look like two years have passed? I scrutinize these photos, wondering whether I’ve aged. Then I berate myself for being shallow and silly. 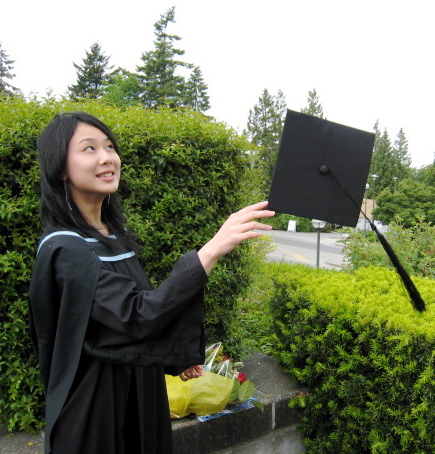 I congratulate the many high school grads I know and wish them well. Certainly it’s a milestone achievement deserving of celebration. But then my inner cynic surfaces and quips that it’s not as big a deal as some people make it. Because I’ve noticed that the big mainstream universities have a tendency to take students in eager and fresh-faced, then spit them out bitter and jaded. It happens over time, when they realize that their 97% in high school is only a 75% in uni. And even if it isn’t, even if it’s still an impressive 90%, no one cares anymore. The numbers have ceased to matter. And this isn’t a bad thing, necessarily. Still, I wonder whether such overemphasis on grad sets these eager, fresh-faced teens up for disillusionment. It is, after all, only a small blip in the story arc of their lives. Kind of like a wedding. All that fuss for one day so insignificant compared to decades of marriage. 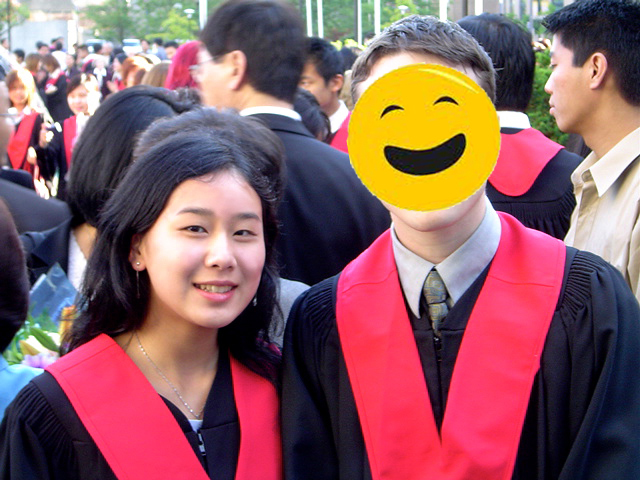 My own high school grad occurred in the pre-facebook era, so it was surprisingly tough digging up pictures. Have I aged since then? I finished my music history paper on Chinese opera around midnight last night. Writing up the appendix took another hour or so, along with topping up my required six hours of listening to the genre. There was also a quiz on rock and urban music to speed-study for. By the time I hit the bed, there was so much data swirling around behind my eyelids that I COULDN’T SLEEP. And then Kevin’s alarm woke me up at 4:50. And when my alarm rang at 6:30, I turned it off. So by the time I got up it was 7:15. Which means I’d miss my usual bus. And in Surrey, most of the busses come in ridiculous half-hour increments. Long story short, I caught the later one and still made it in time for class. Because when I arrived seven minutes late, it hadn’t started yet.